He Jiankui speaking in Hong Kong last year. Officials in Guangdong Province have completed a preliminary investigation of He’s activities, accusing the embattled scientist of violating federal laws and saying he did so “in the pursuit of personal fame and gain,” Xinhua News Agency reported earlier today. In addition, the investigators said He forged documents, faked lab work, operated clandestinely after funding his own project, and recruited other scientists to conduct the work. He, along with the other unnamed individuals involved, “will be transferred to public security authorities” and “severely dealt with according to the law,” officials told Xinhua, as relayed by the Wall Street Journal. 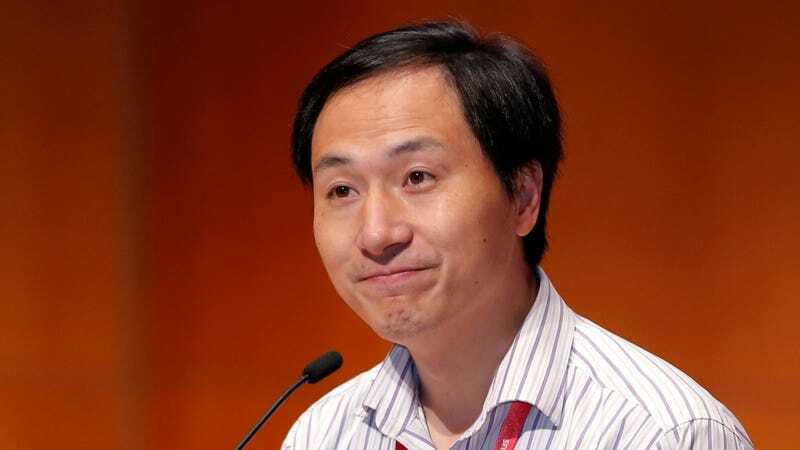 Speaking in Hong Kong at the Second International Summit on Human Genome Editing this past November, He shocked the world by announcing the birth of genetically modified twins. The scientist claimed to have used the CRISPR/Cas9 gene-editing tool to modify human embryos and then implant them into a mother’s womb—an illegal procedure under Chinese law. The twins, dubbed Lulu and Nana, are allegedly immune to HIV owing to the deletion of a specific gene, but it’s not known if the modification worked or if the girls will face long-term health consequences. Critics claimed the research was performed prematurely and without oversight, and that He avoided the normal channels, among other accusations. The experiment was deemed unethical owing to the nascent state of CRISPR technology, and also because the unproven modifications are heritable. He, a scientist at the Southern University of Science and Technology in Shenzhen, was reportedly placed under house arrest following the Hong Kong summit. Earlier this month, geneticist Robin Lovell-Badge of the Francis Crick Institute in London warned that He could face the death penalty for corruption and bribery charges, though the claim was apparently made without warrant. The accusations levied at He were bad, no doubt, but this latest development is really bad. As the WSJ pointed out, it’s the first time the Chinese government has acknowledged the births (despite China suspending the scientist and launching an investigation), and it’s the first hint of He’s fate. What’s more, we’re learning some unsettling new details about his experiment. The Guangdong investigators told Xinhua that He started the project in June 2016 and used a fake ethical review certificate to proceed. Eight volunteer couples were reportedly recruited for the experiment, which was conducted between March 2017 and November 2018. All males in the experiment tested positive for HIV (the point of the project was to endow offspring with a built-in immunity to HIV, and thus protect them from an infected parent). Two of the volunteers got pregnant, leading to the birth of the twin girls. According to reports, one woman remains pregnant, one of the couples quit during the experiment, and the other five couples couldn’t conceive. The babies and the pregnant volunteer are currently being monitored by health officials, Xinhua reported. Disturbingly, He allegedly used fake blood tests as a workaround given that HIV-positive individuals are prohibited from participating in assisted reproduction, officials told Xinhua. No further details were given. From here, we can only assume that He will be prosecuted and put on trial. Looking at the details of this preliminary report, however, it seems his fate may be a foregone conclusion. China is currently clamping down on corruption and fraud, so given the high-profile nature of this case, the government will likely come down hard and make an example of He and his colleagues. Why Cancer Is Replacing Heart Disease as the Leading Cause of Death in the U.S.